Although summer is still months away, it feels like it’s here because Infestation 2 #1 feels like a big summer crossover/comic event. And in fact, it is. Duane Swierczynski does a FANTASTIC job setting up this event. This issue is both set up AND execution. 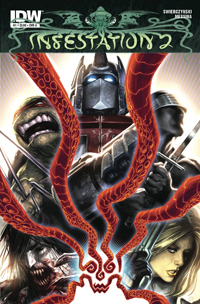 While none of the licensed characters appear in this issue, you get the origin of the monsters that are set loose to go and attack the Transformers, Teenage Mutant Ninja Turtles, the GI Joe team, and more. This is one comic that’s packed with action from start to finish. Any history or continuity points are revealed in between action sequences. This is a great first chapter to the next two months of Infestation comics. Comixology and IDW Publishing announced today that they will be offering a half off, 99-cent sale for IDW’s recent crossover event Infestation. Now, you know how crossover events work, right? A comic book publishing company schedules a mini-series that “changes the face of the comic book company forever!” You know about those right? All the big companies do them. And you also may know that IDW has a lot of licensed properties and there’s not a lot of marriage between those comic book titles, as well. Right? Well, you’d be right on all those accounts. So, if it’s hard to wrap your brain around, I totally understand. It’s hard for me, too. But in 2011, it actually happened! That is correct, sir or madame, IDW tied together their universe with a zombie outbreak story that infected and affected the pages and characters of Star Trek, Transformers, G.I. Joe, and Ghostbusters. That’s both insane and awesome, isn’t it? I mean, I don’t know how it works, but I’d love to see a zombie Transformer. IDW Publishing will be bringing back their Infestation series, with the aptly named Infestation 2. 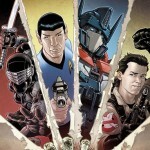 The first Infestation dealt with a zombie invasion attacking some of IDW’s most popular licensed properties such as GI Joe, Transformers, Ghostbusters, and Star Trek. 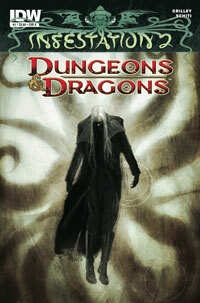 This time around, it’s not zombies, it’s Lovecraftian “Old Ones” gods attacking from across time and space.